Take a sneak peek inside my Weegie kitchen with the continued A-Z of my favourite ingredients. Previous posts include: Ginger to Lemons & Limes and Almonds to Fresh Pasta. You would be forgiven for overlooking the importance of salt when it comes to cooking or indeed appreciating the variation on offer. After all we are warned of the health risks from a high salt diet. However this does not mean we should forgo salt in our cooking altogether. On the contrary I reckon we should embrace salt in our cooking but instead be more mindful of what salt we use. Most Table Salt, this is the fine grained stuff you find in salt shakers at chip shops, contains additives and this is where some of the health concerns come from. Sea salt comes unrefined so only contains natural minerals and is therefore, in the salt world at least, the better option health wise. Sea Salt has a less bitter but more intense flavour compared to table salt so a little goes a long way. If you swap table salt for sea salt you will also notice a massive difference in flavour and actually end up using less salt in your cooking. 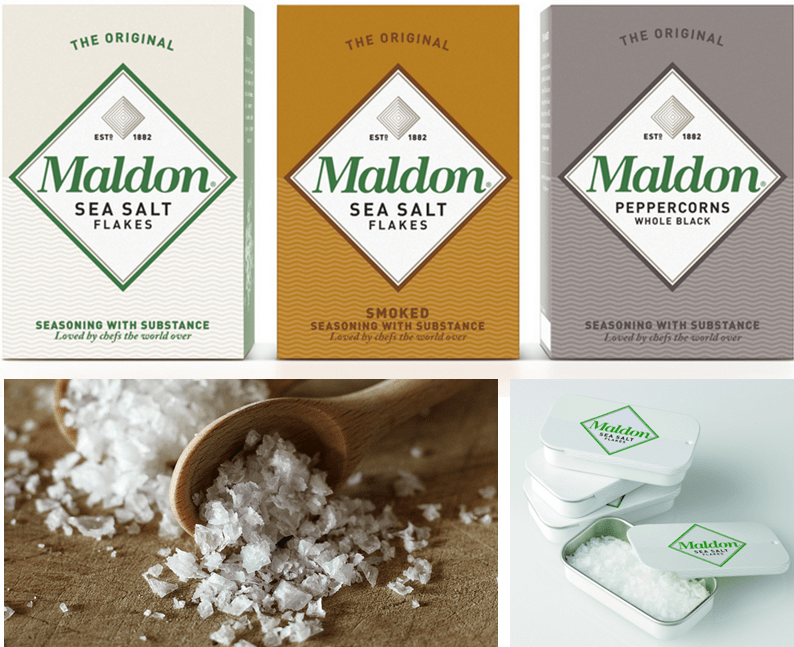 I’ve always used Maldon Salt because its cheap, its British and I find the salt crystals soft enough to crumble between my fingers when adding to food. If you absolutely must have salt on the table then invest in a salt grinder, use sea salt in the grinder and bin the table stuff. Nam Pla (Fish Sauce) is a South West Asian fermented fish sauce but I swear the sum of its parts is much better than it sounds. It’s one of those ingredients that might make you think ‘why bother’, when you consider only a few drops are required in any given meal. If you think of Nam Pla as the Thai version of Worcestershire Sauce (both are essentially the same thing) and consider how MUCH of a difference Worcestershire sauce makes to Spag Bol or Cheese on Toast, you may begin to feel differently. While Nam Pla on its own may not make a massive difference to flavour, I see it as part of a flavour base in all Asian cooking, much the same way I see onions as part of the flavour base for stock. I wouldn’t taste an onion-less stock and immediately notice onions were missing but I would certainly notice a difference in flavour, even if I couldn’t identify what it was. This is because onions, along with the rest of the veg, are what makes up the combined flavour in stock. For me, the same goes with Nam Pla in Asian cooking when combined with garlic, ginger, soy sauce, chillies and sesame oil. There are tons of different brands but I tend to stick with imported Asian brands. 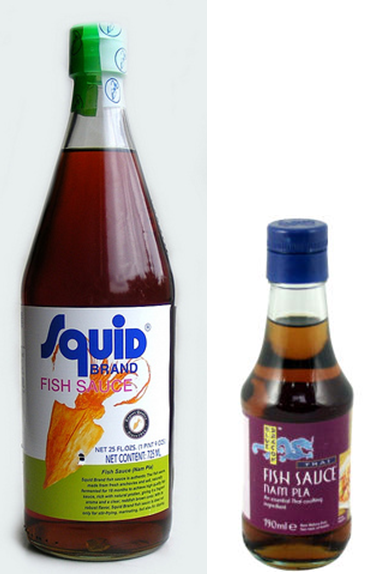 I’m currently favouring Squid which I can get easily from my local Tesco or Asian Supermarket. Despite the fact it is imported, as with many international ingredients, I find I get more for my money and I’m safe in the knowledge that its the genuine thing and not an Anglicised version. If you’re looking for inspiration try my Thai Fishcakes but don’t let the fact that its called Fish Sauce deceive you. As strange as it may sound you can use this sauce with any meat dish. Crumble Mix. Never underestimate the power rolled oats can bring to a humble crumble mix. I make a crumble mix with flour, butter, demerara sugar (for crunch), vanilla caster sugar (for flavour), ground almonds (because that’s what my Gran does) and flaked almonds and oats (for texture). If I can get them, I favour jumbo rolled oats over regular sized oats. This is purely because I like a bit of consistency in my porridge but when it comes to crumble mix I’m not fussed either way. 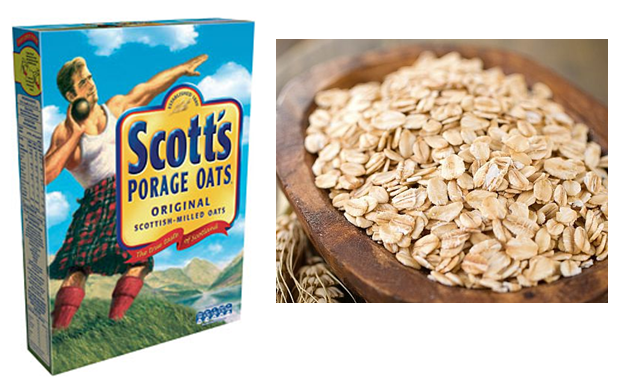 Of course, I always go for Scott’s Porridge Oats. 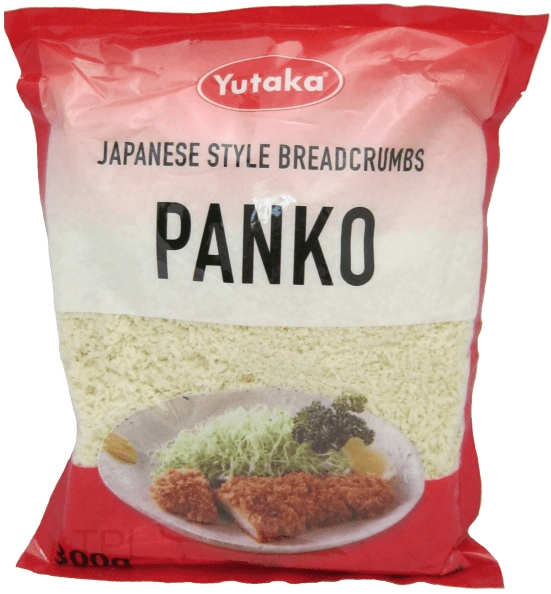 Panko Breadcrumbs are the Japanese variety of breadcrumbs and come in very dry flakes. I can get Panko easily from my local Tesco although if you end up using it as often as I do, try an Asian Supermarket for bigger bags at a cheaper price. Aside from the fact my food processor is on its last legs which makes it difficult to make my own breadcrumbs, I favour Panko simply because they are lighter and absorb less oil when cooking. This means they give an incredibly light and crunchy coating to absolutely anything you want to deep or shallow fry. Some of my favourite recipes using Panko include: Fishcakes, Fish Fingers (which I eat in a Taco or sandwiched between white bread & lashings of tartar sauce) and the Daddy of ’em all, Katsu Curry. However you can use Panko to coat any type of meat, fish or vegetable. Just dust in flour, dip into beaten egg or Tempura batter and coat in breadcrumbs before deep or shallow frying. I have to stop myself giggling when I talk about Quince Jelly because it sounds ridiculously posh. I feel I’m 1 sentence away from saying the landed gentry are coming for supper. What can I say, I’m a working class girl at heart but I cant bare a cheeseboard without this wee fella. Cheese boards are quite a serious affair in our house. We pride ourselves on our various accoutrements (knives, boards, little dishes and spoons), our ability to pair a strong Cheddar with a creamy Strathdon Blue and our selection of condiments to set the whole thing off. While chutneys, pickles and relishes are all well and good, nothing compares to the sweetness of Quince Jelly. You just cant find this flavour in anything else. Quinces taste something like a cross between a pear and an apple. When its made into a jelly the flavour concentrates and becomes much sweeter which makes it a perfect accompaniment to a strong cheese. You can buy it from Deli’s (or posh supermarkets like Waitrose) and it comes in a solid red coloured block which you can slice thinly. Perfect on top of a dainty little cracker. There are a few food related things I am positively evangelical about and they are: Free Range Organic eggs; Vanilla Caster Sugar; and Rapeseed Oil. Seeing as we are still on R, I’ll rant solely about the benefits of Rapeseed Oil for now. I know Olive Oil and Extra Virgin Olive Oil are the bees knees of the oil world but consider these 3 points before you pick up another bottle. Rapeseed is grown in our own country. You know those bright yellow fields you see everywhere? That’s rapeseed. So no one can criticise you about ‘air food miles’ and ‘buying locally’ when you cook with Rapeseed Oil. It’s a healthier fat even compared to Olive Oil. Rapeseed has less saturated fat and higher levels of Omega 3. Rapeseed oil has a higher smoking point compared to most other oils. This makes it perfect for everyday cooking because it won’t burn or become acrid at very high temperatures. I use Tesco organic Rapeseed Oil for my everyday cooking and keep a good bottle of cold pressed Extra Virgin Rapeseed for anything which isn’t being heated: Salad dressings, Soup, Foccacia, Pesto and the like. 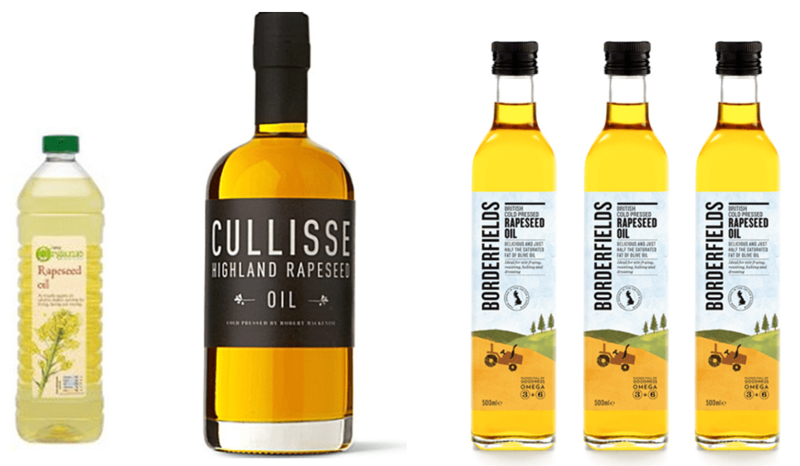 My favourite brands are Borderfields (which also do cracking flavoured oils) and Cullisse (whose bottles are so beautiful they resemble Whisky bottles). Their buttery flavours are second to none, to the extent you could happily replace the butter on your toast with a little drizzle of E.V Rapeseed Oil. Where to start!! These are all favourites of mine too, although I am a porridge with salt girl!! I definitely don’t use fish sauce enough as I am a bit unsure but will try be a bit more inventive now! !